When Hasbro introduced the 6 inch Star Wars Black line fans, myself included, fell instantly in love. 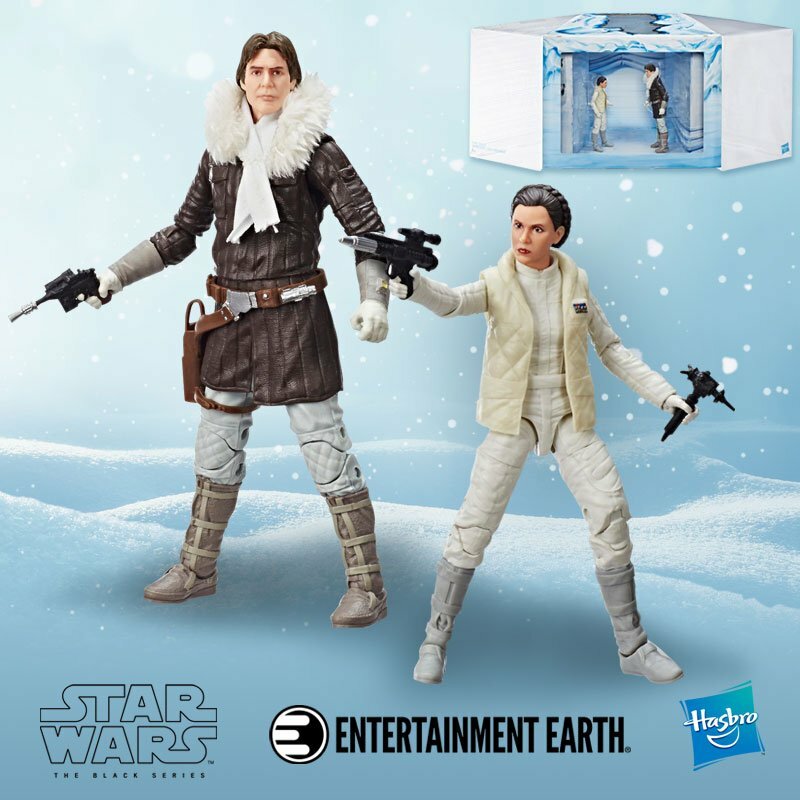 The figures are highly detailed but are a bit pricy and come with limited equipment; now Hasbro has upped their game by producing deluxe figures. The first releases in the deluxe assortment are Jabba the Hutt and a Biker Scout complete with Speeder Bike. I have always been a big fan of the Scout Troopers ever since their first appearance in Return of the Jedi. 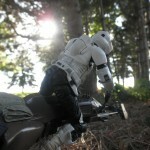 I have to say that the Speeder Bikes and the Scout Troopers were my favorite part of that dismal movie. That being said, earlier this year at the International Toy Fair in New York I had my first look at the 6 inch Biker Scout and it was love at first sight. Now after months of waiting with eager anticipation I finally have one of my very own. Before I even get into reviewing the figure and the vehicle I must comment on the packaging. The box is nothing special, it is the packaging inside that is an issue. 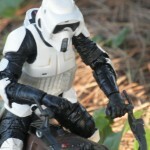 The Speeder Bike is somewhat delicate and the plastic packing material keeps it very secure. I do understand Hasbro wants the toy to have “shelf appeal” and they want to keep the bike from bouncing around but if a person isn’t careful the bike can be broken very easily while trying to remove it from the packaging. The directional steering vanes on the front of the bike are passed through a hole in the internal packaging, presumably to keep it locked in place. Seriously, the Speeder Bike is really secure in the packaging and unless you (or the person you purchased this for) take the time to remove it slowly you will break something. That being said, let’s move onto the Speeder Bike itself. 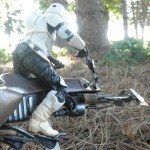 As I stated before the Speeder Bike is a little delicate. 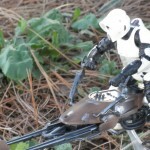 As strange as this may sound despite being delicate the Speeder Bike is quite sturdy. 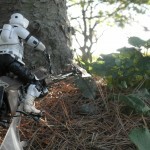 The Speeder measures approximately 10.5 inches long and is very highly detailed. There is a moveable blaster cannon that pivots from left to right mounted on the bottom of the Speeder Bike and moveable thruster flaps on the back. In my opinion there really isn’t a need for anything else to move. I like the fact that the maneuvering controls (the handlebars) do not move which helps the figure maintain its pose. Another feature to help secure your figure are the pegs on each of the foot petals. 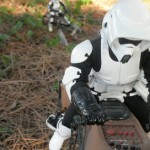 The Speeder Bike can be attached to the stand that is included in the set. The stand has a ball end that fits into a socket on the bottom of the Speeder Bike. This allows the bike to be posed in several different ways from banking on a turn to cruising along the road. 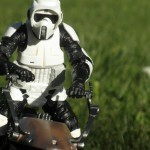 The Speeder Bike will look great on your shelf or on your desk or a bookcase. Basically it will look good anywhere. Being able to pose your figure in any position is bonus. I remember when the first Star Wars figures were released they had at most 5 points of articulation and we loved them. It would have been nice to have figures this poseable back then. 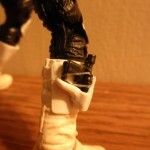 The figure also comes with a Scout Trooper Blaster (AKA Holdout Blaster) which fits in the holster on the trooper’s boot. The only problem I found with this figure is the fact that his right leg has a slight bow. When the Biker Scout is on the Speeder Bike the subtle deformity is not noticeable but when stand up the figure you can see the curvature. I did read online that some others who have opened their Speeder Bike they too have had this problem as well. This problem does not detract from the beauty of this figure or this set for that matter. 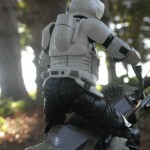 The Speeder Bike with Biker Scout figure from Hasbro retails for 39.99. Although it was a bit pricy I couldn’t pass the set up and if you want one neither should you. I do recommend this figure to anyone into Star Wars or even if you are just into action figures this is a great addition to any collection. 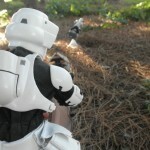 This entry was posted in Equipment and tagged Action Figure, Biker Scout, Collectible, Galactic Empire, Hasbro, Return of the Jedi, Star Wars, Star Wars Black, Star Wars Black Figure, Stormtrooper, Toy. Bookmark the permalink.